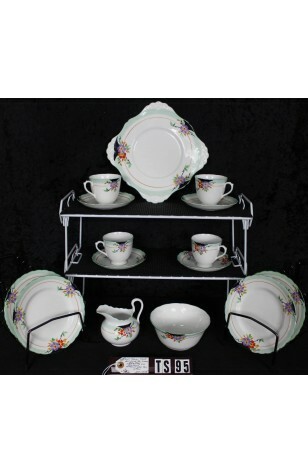 Antique - Plant Tuscan China Tea Set - Made in England (unknown pattern) - Made from 1920 thru 1936 - Totaling (15) Pieces - Art Deco, Service for (4) Four. This is a beautiful Antique, Plant Tuscan China, Pattern Unknown, Made in England during 1920 thru 1936. according to the "Back Stamp". A pattern of Orange/Red, Lavender/Purple Flowers on a White Background, having Green/Tan Leaves, and Mint Green Band, on the Edge of the Pieces. The Flower Bouquets have Black Outlines for Definition, with 22kt Gold Verges, Darker Green Rims, and Handles, on Cups. Plates are Scalloped. 4 - Bread, Dessert, Tea Plates - 6 7/8"